VAC AERO has been a leading provider of heat treating services to aerospace and other high technology industries since 1959. Through this experience, we’ve come to appreciate how important it is to maximize furnace uptime. 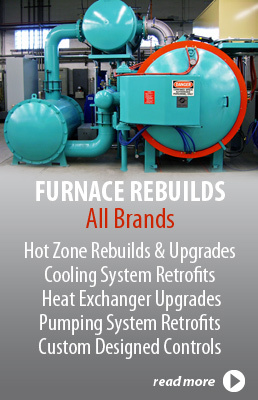 As a result, we place a strong emphasis on service and support of all furnace equipment we build. 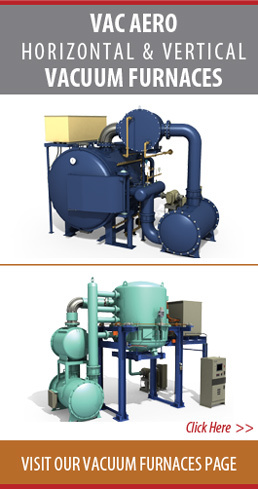 VAC AERO’s Furnace Manufacturing Division offers a variety of maintenance and repair services and training to vacuum furnace operators. 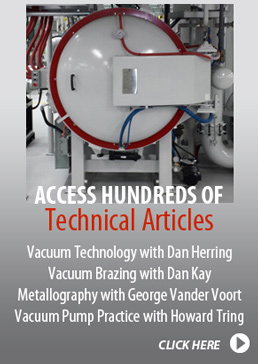 VAC AERO specializes in hot zone repair or replacement for all major vacuum furnaces brands. 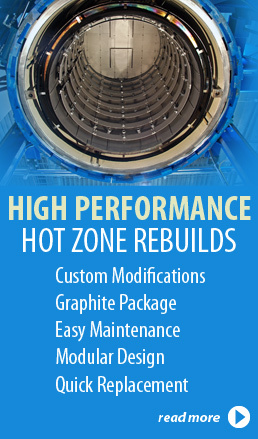 Replacement hot zones are constructed using state of the art manufacturing technology and materials for years of reliable service. Both graphite-based and all-metal heat shield construction is available. All hot zone materials and new designs are fully tested in our own commercial heat treating facilities before being offered to our customers. The efficiency of mechanical vacuum pumps will decline with age as seals and sliding surfaces on pump internals wear. With proper operating clearances of only a few thousandths of an inch, worn pump internals can quickly cause a reduction in performance. Fortunately, pumping efficiency can usually be restored by replacing the worn parts. VAC AERO can perform these pump re-builds onsite, usually in less than a day. VAC AERO also specializes in the cleaning and maintenance of delicate diffusion pump internals. Perhaps one of the most difficult trouble-shooting activities in the maintenance of vacuum furnaces is finding the source of and repairing small leaks. The process requires experience and the right equipment. An air or moisture leak in a vacuum furnace can lead to a discoloured or improperly processed load and damage to the furnace internals. Often, helium leak checking is required to determine the source of a leak. VAC AERO’s skilled technicians are equipped with the latest in leak detection equipment and are expert in the diagnosis and repair of vacuum integrity problems. All furnace equipment should be properly instrumented and periodically tested for accuracy and uniformity. This means that furnace instrumentation (temperature controllers, vacuum gauges, chart recorders and overtemperature safety devices) must be regularly calibrated. Furthermore, the furnace should also be checked for proper temperature uniformity. The frequency of instrument calibrations and temperature uniformity surveys are largely governed by the type of furnace and its previous history of accuracy and reliability. Calibration and survey techniques require knowledge of applicable pyrometry and processing standards. Furthermore, the equipment used to conduct these tests must be fully certified and traceable to recognized standards. VAC AERO maintains a staff of qualified instrument technicians that can provide calibration and survey services covering a wide variety of heat treating equipment. For long-term reliable operation, many key components in a vacuum furnace require regular preventive maintenance. Actual operating conditions will determine the best intervals for maintenance activities but operating manuals will usually provide practical guidelines. There are a number of safety issues that must be considered when maintaining vacuum furnaces. Standard safety practices (electrical lock-out, confined space entry, etc.) must be adhered to in order to avoid injury but there are also special safety practices specific to vacuum furnace maintenance. Recording maintenance activities in a logbook is a good method to develop a history for the furnace. This in turn can be useful in determining maintenance intervals. VAC AERO provides preventive maintenance programs for all types of vacuum furnaces as well as training services for our customers’ maintenance technicians. VAC AERO’s commercial heat treating divisions operate dozens of furnaces in several locations. To keep our heat treating equipment running, we maintain a large inventory of spare parts. Our furnace customers have access to this same inventory. Spares can be ordered by telephone or on-line and are often shipped the same day. You can depend on VAC AERO’s dedicated and experienced support teams to help you maintain optimum furnace performance and to provide you with the following services to keep your plant running as efficiently as possible.